It seems that Jim Crow had an easy answer for labeling people. I thought that we were supposed to be trying to move beyond that. Labels promote focusing on how we are different rather than how we are alike. Assimilation is what has made the United States different from any other nation in recent recorded history. Why must we continue to put labels on people? Why not just American? Until we drop the hyphen-monikers we will continue to promote a society divided by birth appearance rather than a society that acknowledges one's membership in it. As long as we attempt to carve up our society on skin tone, we will continue to call each other racist or generalize to stereotypes. Some people exploit labels to foster adversity between citizens and create a base of political power for themselves. Ironically, these individuals will resist this effort to create a "colorblind" society. Such individuals frequently point their fingers at others and cry "racist" but they don't look into the mirror at what they in fact represent. Doing away with labels would definitely threaten their political power. 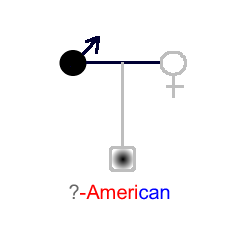 I thought that if I were born in the USA, I could consider myself a "native". Labels are not fair to the children of multiracial couples. This should be reason enough for dropping this question on applications, census forms, and the like. Think about it. Why not just American? That's not so radical. It will enable us to look to the future rather than bog down in the past. What do you think?